A 1930 graduate from Yale University, Winthrop Hale “Ding” Palmer was a standout for the Yale hockey team, lettering in 1928, 1929 and 1930. Showing a glimpse of the future, Palmer, as a Freshman, scored a combined 7 goals in back to back games, four against the Melrose (Mass) High School hockey team on January 22, 1927, in a 4-0 win, then on January 25, the same day he was elected captain of the freshman team, he again scored all the teams goals, this time in a 3-1 win over the Choate School, a boarding school located in Wallingford, CT.
Palmer made the varsity team in his sophomore year, 1927/28, that same season, he set a Yale single season record for goals scored with 52, including a seven-goal game against the University of New Hampshire on January 24, 1928. He graduated as Yale’s all-time leading goal scorer with 87 goals. According to the Yale Hockey website, these two records still stand today. Prior to playing hockey at Yale, Palmer, who was born in Warehouse Point, Connecticut in 1906, attended the Kent School in Kent, Conn, where along with hockey, he played football, baseball and tennis. The Kent School is also where he got his nickname “Ding,” not even Palmer himself knows why he was tagged with that nickname, but he was very happy with it as detailed in a New York Telegram article by Hockey Editor James Bouchard, that was referenced in the January 11, 1932 Hartford Courant, Palmer was quoted as saying “it is more pleasant to hear come on Ding, score another, than it is to hear oh, you Winthrop, well played, well played.” Once at Yale he dropped all other sports, focusing only on hockey, to give himself more time to devote to his studies. Both his father (Holkins Palmer) and brother (Holkins D. Palmer), before him, had played hockey at Yale. His father, who Ding called a “hockey nut” played on the inaugural Yale team. Ding, who was described as having “strong wrists and forearms plus an inborn hockey horse sense,” had a very hard shot and took delight in shooting from center ice. After graduating from Yale, Palmer would bring his hard, accurate shot, scoring prowess and “hockey horse sense” to the University Club team of Boston where he would compete mostly against area college teams. 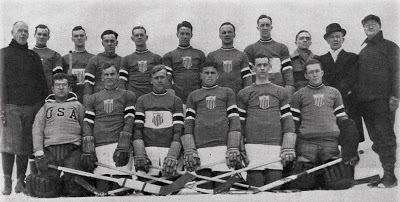 With a roster that included a group of forwards that head coach Alfred Winsor, staying true to his defensive philosophy, selected for their ability to be able to “come back and play defense,” the U.S. hockey team was set to play their first game of the 1932 Lake Placid Olympic games on February 4 against a very powerful Canadian team - The Winnipegs. With the U.S. playing a quick aggressive game and leading 1-0 in the third period, both Ding Palmer and Jack Garrison, with about two minutes go, took penalties. With both players off the ice, Canadian Harold “Hack” Simpson tied the game. In overtime, Victor Lindquist scored giving the Canadians a 2-1 victory. The next day the U.S. took on Poland, with goals by ex-Yale players John Bent and John Cookman, who scored twice, the U.S. came away with a 4-1 win. The February 7 game against Germany was an easy 7-0 win that saw the U.S. dominating while keeping the Germans from barely getting any shots from within the blue line. Ding Palmer starred in this game, scoring three goals and an assist. On February 8, the U.S. once again took on Poland, Palmer scored two more goals in a 4-0 U.S. win. The German game on February 10 was much the same as the first meeting between these two teams, this time it was an 8-0 U.S. win that saw Palmer score two more goals and add another assist. On February 13, the United States faced Canada in the second-round robin game between the two teams, a game the U.S. needed to win in order to force a playoff game that would decide the gold medal. 2:17 into the first period, Ding Palmer, after having dove into a corner for the puck, passed out to Douglas Everett who put the puck into the Canadian net. At the 9:47 mark of the first period Canadian Hack Simpson on a “slick move” that got U.S. goaler Franklin Farrell out of position, scored to tie the game at one each. In the second it was Ding Palmer who scored at 13:38 from a rebound of a John Bent shot to put the U.S. ahead 2-1. The score remained that way up until the 14:10 mark of the third period when Canada’s Romeo Rivers scored, tying the game at two. After three scoreless ten-minute overtime periods were played the game ended in a tie and Canada, finishing with 11 points to the U.S.’s 9 points, was awarded the gold medal with the United States earning the silver medal and Germany taking the bronze. The tournament format for the Third Olympic Winter Games was a double round robin, two games played against each opponent. Period lengths were 15 minutes long, with overtime periods being ten minutes. The standard rule for International Hockey at the time was if after three sudden death overtime periods there was no winner, the game would be declared a draw. There were only four teams that took part in the Olympic Ice Hockey Tournament that year - Canada, United States, Germany and Poland. 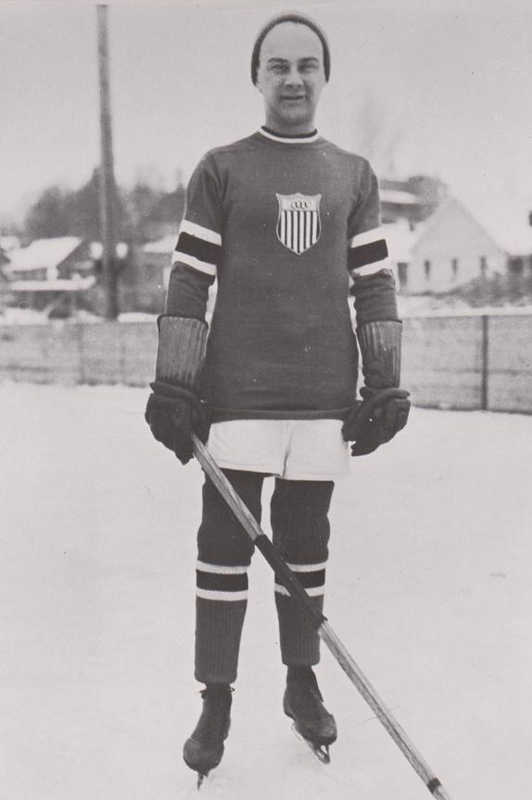 In the Six games played during the 1932 Olympics, Winthrop “Ding” Palmer scored eight goals and added three assists for 11 points with 2 PIM. Turns out those 2 PIM’s just may have been the difference between Olympic gold and silver. His eight goals led all players, the 11 points tied him with Canada’s Walter Monson for the lead in the tournament. 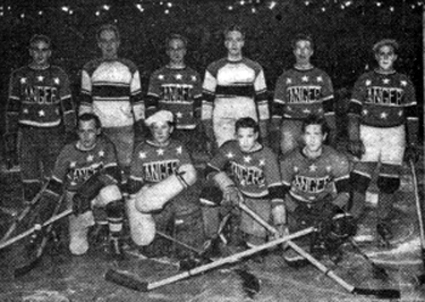 The Massachusetts Rangers began play in the World Championships on February 21 with a 7-0 win over Switzerland. They then followed up with three more consecutive shutouts over Poland 4-0, Czechoslovakia 6-0 and Austria 4-0, setting the stage for a matchup with the Toronto National Sea Fleas representing Canada and coached by Harold Ballard, future owner of the Toronto Maple Leafs, in the finals. The game took place on February 26, the Massachusetts Rangers would pull out a 2-1 overtime victory. This was the first, and so far, only World Hockey Championship the United States has won. It also marked the first time the U.S. had defeated Canada in International competition. In five games played during the World Championships Palmer scored 9 goals and collected two assists for 11 pointsto lead the U.S. team by a wide margin. Palmer was a popular player who earned the respect of the Europeans, not only at the 1933 World Championships but throughout the tour of Europe. In 11 combined games played in the two international tournaments (Olympics and WHC), Palmer totaled 17g - 5a - 22pts with 2 PIM. Palmer was selected to play for the United States at the 1936 Olympic games but, because of business interests, decided not to play. Ding Palmer played the majority of his amateur hockey in Boston up until 1936 when he left to play for the St. Nicholas team of the New York Amateur Hockey League, until an injury forced him to quit during the 1938 season. After hockey, he spent a few years playing competitive badminton for the New Haven Lawn Club in the Connecticut Badminton League. In 1973 Ding Palmer was inducted into the United States Hockey Hall of Fame. Walter A. Brown was the one time President of the Boston Bruins and was the founder of the NBA’s Boston Celtics. Brown was inducted into the U.S. Hockey Hall of Fame, The Hockey Hall of Fame, The IIHF Hall of Fame and the Basketball Hall of Fame. The number one was retired by the Boston Celtics and hangs in the rafters of the TD Garden in Boston, Massachusetts. Harold Ballard, who coached the Toronto National Sea Fleas and later owned the Toronto Maple Leafs, was inducted into the Hockey Hall of Fame under the Builder’s category. He was known to have a philanthropic side as he donated to many charities. From the Boston Globe, April 23, 1933. The 2017 IIHF Guide and Record book has the team name as the Boston Olympics. From a Boston Globe article dated April 23, 1933, written on the occasion of Walter Brown and Gerry Cosby’s, (Mass Rangers goaltender), return to Boston from Europe. The Society for International Hockey Research database has Palmer with a goal total (from the Euro tour and the World Championships combined) of 35 goals. Roger A. Godin’s monograph, “Prague Winter 1933” lists Palmer’s goals total at 35. Those are the totals I used in this article. The April 23, 1933 Globe article has him scoring “44 total goals, despite missing 12 games.” In Prague Winter, there were 6 games listed that do not indicate any American goal scorers. So, the possibility does exist that Palmer had more goals than what is listed in those two sources for the entire tour. Several websites and the 2017 IIHF Guide and Record book list the date he passed away as February 4, 1970. An article In the Hartford Courant from February 6, 1970, a Friday, says that Palmer died on Thursday morning which would make the date of his death February 5, 1970.